Regent Soc­cer Club, Inc. is a non-profit 501c3 youth soc­cer orga­ni­za­tion based in the near west side of Madi­son. Our GOLD PROGRAM offers neighborhood teams from u6-u14 and our BLUE PROGRAM offers select/tryout teams from u11-u18. Our goal is to allow play­ers to develop a love for the game by promoting an inclusive, fun, afford­able, player-centered environment. Except for kinder­garten (U6) which is spring-only and High School (fall-only for HS girls, spring-only for HS boys), our teams play in the fall and spring. Regent SC will be updating our website weekly with an article of interest for you and your players. (if you would like to make suggestions of for an article please send Julie an email. julie.bernhardt4@gmail.com). You can also see archived articles on our Coaches/Managers page. WHAT'S NEW IN REGENT SC??? 2019 SUMMER CAMP Reg is open!! Regents own Genevieve Nashold- also known to some as Bam Bam wins WI ATHLETE OF THE YEAR!!!! Grass Roots Education: Play, Practice, Play- read about the new grassroots changes to coaching education and why US Youth Soccer is embracing this approach. Check out our VIDEO page to help you coach technique. Registration for our Spring Kindergarten (2012 & 2013) Program is still open and we have space on some rosters! Please click on the hyperlink for more information. Tryout registration for U11+ 2019-2020 Blue teams is open for our Regent families--register early to avoid late fees! Registration for 2019-2020 Gold (non tryout) rosters opens May 1. Please plan to register as early as possible to help us in team formation. RAIN OUT LINE: 608.267.8787. Press option 2 for central parks and 3 for west parks. Our parks are listed below including a west or central designation. Typically the parks dpt updates by 2pm weekdays and 9am weekends. The line will be updated if fields are questionable, if no update by the times listed, fields are open for play. Fields that are closed for maintenance are listed on the website and NOT listed on the rainout line. *We will update this page ASAP. Please notice the update date/time in the rt corner above the listed parks. If field playability is questionable and we have yet to update- please refer to the hotline. PLEASE BE MINDFUL AND KIND TO OUR PARKS. IT IS NOT NECESSARY TO TRAIN IN GOAL MOUTHS OR HEAVY TRAFFIC AREAS- ESPECIALLY WHEN IT IS OR HAS BEEN WET. No school- Open Play Food Drive! Regent SC hosted their 3rd annual no-school/open play/food drive event on November 21st. The event was a huge success with 115 players attending. Our u8-u14 players also donated 235# of food to a local food pantry and great time was had by all!!! Another successful Regent/MU camp is in the books!! A great time was had by all. We worked on our soccer skills and even had a guest speaker come! Alicia Pelton visited us and we learned about leadership qualities and how they relate to being on a soccer team. See our camps page for some more videos from the week! See everyone soon!! 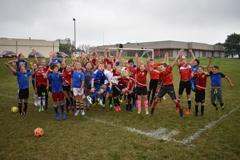 Soccer Saves lives camp 2018!!! Several of Regent's very own have donated their time to host a summer soccer camp for our youth! Soccer Saves Lives camp 2018 was able to donate $690 to the Leukemia and Lymphoma society this year! way to go!! !